Pack of FOUR (4) ASSORTED SIZES Beading Needles. You will receive one (1) #10 Short, one (1) #10 Long, one (1) #11, and one (1) #12 Beading Needles. What do you get when you combine a company that has been making high-quality needles since 1948 and a Beading Pro like Carol Cypher? 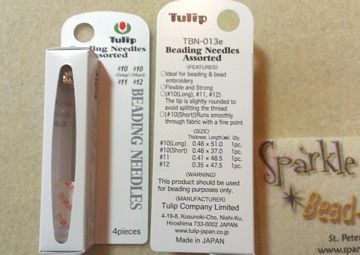 New TULIP Beading Needles!! The specially coated eye can thread up to a 10 lb Fireline and it's rounded design allows it to pass easily through size 15 seed beads. They are flexible for getting into tight spaces and for making those bends, but they are also springy and won't stay bent!